As I've written for the Bebop BB111 strings, this string company is awesome. Great separation of notes. Not muddy sounding. Sometimes I'll substitute the G, B & e with .019, .015 & .011 single strings for a slightly fuller sound and stiffer feel. Either way, these strings sound great!!! 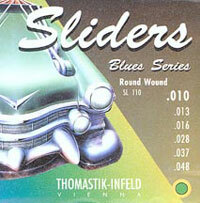 The sliders are great strings; but still more of a jazz string to my ear. Not as bright that the D'Addarios. I like the Bebop string sets better.